Every Spring Anna gets little red bumps all over her body. A couple years ago we had her pediatrician look at the bumps, but she was unable to give us any definitive answer. Kate decided to go ahead and take her again just to see if she might have anything new to add to the situation. As usual, the doctor was confused as to the cause of the bumps. She decided to refer us to a dermatologist to see if he might be able to help the situation. Just before we were leaving the office, Kate asked the doctor to look in Anna's throat just in case she may have contracted Strep Throat from Isabelle recent battles with it. Anna had not run a fever or had any other symptoms; Kate just wanted the doctor to check as a precaution. The doctor did the test and said she would call us with the results. We made our way home to Jay after stopping by the pharmacy to get an antihistamine to help with Anna's itching. As soon as we arrived in the garage, Kate's cell phone rang and it was the doctor informing us that Anna did indeed have Strep. We made yet another trip over to the pharmacy to pick up an antibiotic. Less than an hour later the doctor called back and told us that if we could be in Pensacola in two hours, we could see the Dermatologist that same day. This was good news as it is usually a month long wait to get an appointment. 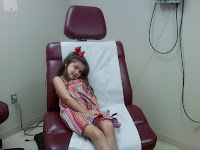 We hurried to the Dermatologist's office and Anna sat in a big red chair while the doctor examined her bumps. He, too, was at a loss as to a definitive cause for the bumps. His best hypothesis was that it was related to something in the air in our area that blooms or pollinates in the spring, perhaps oak or pine. He prescribed a steroid to get rid of the bumps and keep Anna from getting another outbreak this year. He also suggested a visit to an allergist to find out what the real cause might be. We went back to the pharmacy and picked up our third and final prescription. This past week was our church’s week of VBS. Anna was not able to participate in that night’s activities because her Strep was contagious until she had antibiotics in her for at least 24 hours. Anna stayed with Kate the whole evening and while sitting in my office waiting for the closing ceremony to begin, Anna tripped and hit her head on a crate filled with my school books. It was a pretty hard hit and you can see the damage in the photo. I think Anna was glad to see that Thursday come to an end….